From our shop in Deal we supply French-inspired, hand-painted vintage furniture plus a unique range of decorative items, household accessories, soft furnishings, gifts and greeting cards. 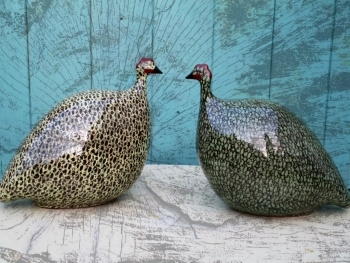 We also offer the acclaimed range of Pintades, a collection of hand-crafted ceramic guinea fowl by Heidi Caillard. Smoke on the Water is an approved stockist of Chalk Paint™ decorative paint by Annie Sloan. We have the full range of over 30 historical colours as well as waxes, brushes and books. If you are looking to decorate your home we are official stockists for Little Greene Paint. In conjunction with English Heritage, Little Greene have developed a collection of period paint heritage colours and an exclusive design collection of wallpapers.